Sculpting Fiber Gel clear 5 гр. Sculpting Fiber Gel pink 5 гр. Sculpting Fiber Gel white 30 гр. 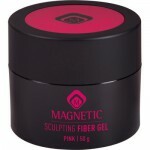 Sculpting Fiber Gel pink 30 гр. Sculpting Fiber Gel clear 30 гр. Sculpting Fiber Gel pink 50 гр. Sculpting Fiber Gel clear 50 гр. Flash Builder Gel thick 50 гр.